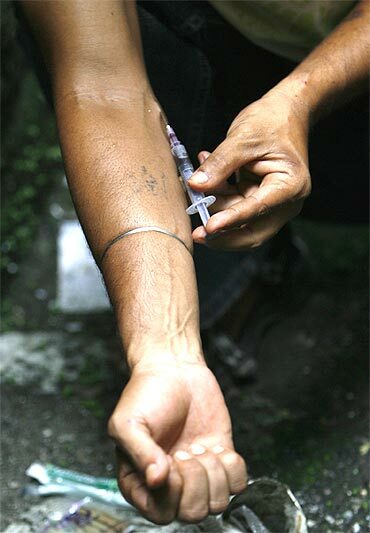 India has become a hub of drugs and is an attractive trans-shipment area for heroin bound for Europe, Africa, Southeast Asia and North America despite constant efforts by governments at all levels to combat this sort of crime, a United States report has said. Located between Southwest Asia (the Golden Crescent) and Southeast Asia (the Golden Triangle) -- the two main sources of illicit opium and other narcotic drugs -- India is an attractive trans-shipment area for heroin bound for Europe, Africa, Southeast Asia and North America, said the 2011 International Narcotics Control Strategy Report of the State Department. "India has become a hub of drugs sold through illegal Internet pharmacies and the misuse of courier services, despite constant efforts by governments at all levels to combat this sort of crime," the report said. The report said India is the world's largest producer of licit opium and the only authorised user of the gum method of opium production for pharmaceutical preparations. This method of production is appropriate for India's labour-rich economy, but is intrinsically harder to police to prevent efforts at diversion. Precursor chemicals and other controlled substances are also diverted, as well as licit pharmaceutical preparations and prescription drugs containing psychotropic substances, it noted. According to the annual State Department report, use of cocaine and heroin is declining globally. Use of alcohol, opium, and cannabis -- the traditional drugs in India -- are giving way to synthetic drugs such as Amphetamine Type Stimulants and prescription drugs, which are easily attainable and can be both bought and sold over the counter, via the Internet, and transported via courier. "The emerging drug abusers in India are young, affluent professionals, beneficiaries of India's recent rapid economic growth, using chemicals to stay awake longer or feel relaxed. With seventy percent of India's population below 35 years of age, the potential number of substance abusers is very large," it said. Image: A boy smokes brown sugar heroin at a slum in Mumbai. 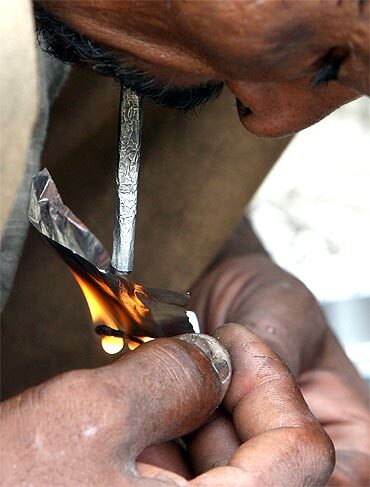 India is also one of the world's largest clandestine methaqualone producers. Methaqualone (Mandrax) in pill and bulk form is mainly trafficked to South America and South Africa, the report said. Referring to an official Indian estimate -- that roughly 10 per cent of licit opium production is diverted for illicit heroin production primarily for local consumption and for the production of crudely refined 'brown sugar' heroin -- the report said this would mean a diversion of 52.4 MT of opium gum.